This book’s exploration of identity transition, specifically the changes involved when women become mothers for the first time, is framed by a methodological perspective: it asks how researchers know what we know from empirical data. It is based on the data from a funded research project.1 ‘A focus on mothers shifts our epistemological, political, social and psychic horizons’ claims Petra Bueskens (2014, p.4). 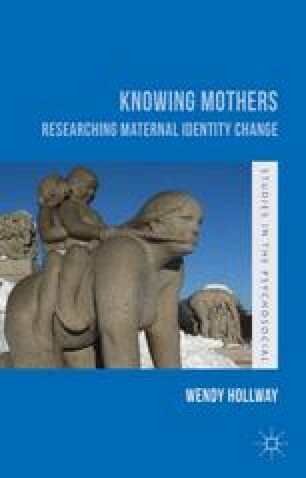 Indeed, research into new mothers’ changing identities has shifted my knowledge horizons: it poses epistemological questions and methodological challenges because the experiences of women as they become mothers are partly beyond words. It is these challenges that provide the structure of the book, and it is in this sense that this is a book not only about new mothers’ knowing and its relation to their becoming, but also about methods adequate for researching such a topic.